This post explains how to obtained timed tickets to the White Garden Tours, which take place 2 times every year. While you can request to tour the White House any time of year, only twice a year are the White House Gardens open to the public. You can stroll through the Jacqueline Kennedy Garden, the Rose Garden, the White House Kitchen Garden and South Lawn of the White House. Check out our Guide to Things to Do in DC, with budget advice, travel guides, and information about local Washington DC attractions, including our Free Things to Do in DC. Below, is a short video describing the most famous of all the gardens at the White House – the Rose Garden. This garden is adjacent to the Oval Office and is the location where the President of the United States will often announce new Cabinet or Supreme Court nominees or new legislation that he has proposed. The White House Spring Garden Tour Dates for 2019 are April 13 and April 14, 2019. Open to guests are the Jacqueline Kennedy Garden, Rose Garden and the White House Kitchen Garden and the South Lawn of the White House Grounds. Unlike the White House Easter Egg Roll, there is no lottery for this event. If you want to tour the White House Gardens, free timed tickets are distributed at the Ellipse Visitor Pavilion located at 15th and E Street Northwest on each tour day at 8:30am. Federal Triangle (Orange, Blue and Silver lines) is the closest Metro station to the ticket pavilion. It’s approximately a 9 min walk from the station. You can also easily walk from Metro Center (Red, Orange, Blue and Silver lines). Click here for directions to the pavilion from anywhere in the DC area. Tickets are distributed at 830 am on a first-come, first-served basis. Tickets are distributed in 30 min intervals. If you have a specific time you need to tour or want to get in right away, we recommend getting there early. Even if you’re there at 830 am, you might get a ticket for 2 pm that afternoon. Like most attractions in Washington DC, the earlier you go, the less crowded it is likely to be. There is a limit of one ticket per person so if you want to go with your whole family, they all need to wait in line. You must go through a security screening before entering on the White House lawn. You may bring strollers, wheelchairs, cameras and umbrellas without metal tips. For those not staying downtown, ask your hotel concierge or inn manager if he or she knows a concierge at a downtown hotel, where you could leave your purses and travel bags. The Jacqueline Kennedy Garden has been a part of the White House landscape for some time before JFK’s presidency but had been all but forgotten. Jackie Kennedy had helped with the redesign and the garden had been planted by the time of JFK’s assassination. The rose garden had been replanted but the East Garden was still in progress. This East Garden was renamed in her honor. In the current garden, you will find Littleleaf lindens and Kennedy saucer magnolias bordered by low hedges of boxwood and American Holly. Perennial flowering plants include delphinium, hollyhock, lavender, and roses. Spring blooming bulbs planted in the rose garden include jonquil, daffodil, fritillaria, grape hyacinth, tulips, chionodoxa and squill. Summer blooming annuals change yearly. In the fall chrysanthemum and flowering kale bring color until early winter. There has been a vegetable garden on the White House grounds since 1800 but the current first lady, Michelle Obama, is probably the more well known for hers. Eleanor Roosevelt had a victory garden during WWII and Hillary Clinton added a garden to the roof of the White House, but Mrs. Obama created the largest vegetable garden in 2009. It came as part of her efforts for a healthier America and the garden provides fresh vegetables and herbs to the First Family, White House guests and also food banks and soup kitchens. You can see the vegetable garden from E Street on the South side of the White House but if you’re travelling with a student or community group, you can request a tour. How to tour the White House Vegetable Gardens? The White House will arrange a free tour for groups of 25 or less who request it online on their website. 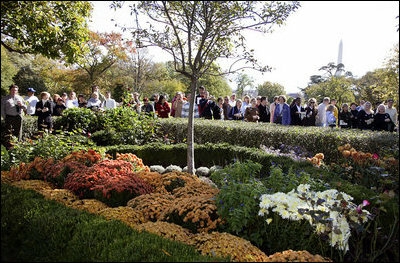 The tour will visit the garden and the beehive and if you’re lucky, also the White House interior. Tours are subject to availability but often occur on weekday mornings.